Are you considering purchasing a water softener alternative, but you’re not sure what to expect? 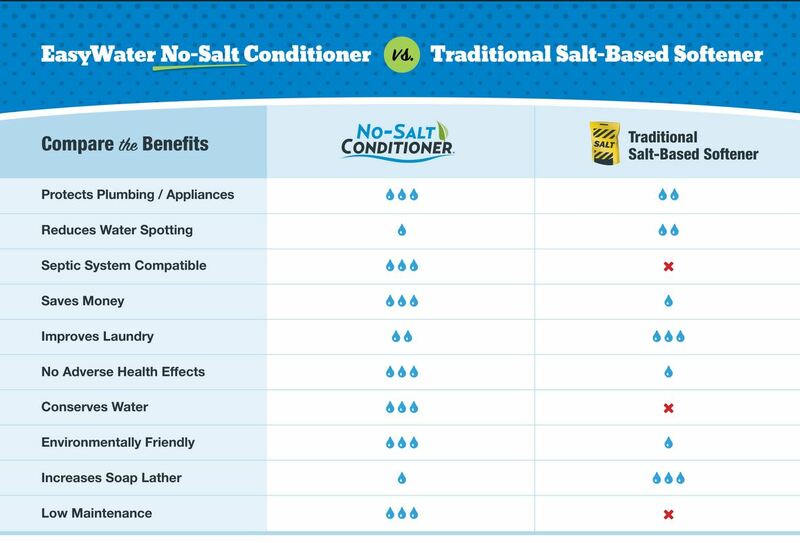 This quick guide will show you at a glance how the EasyWater® No-Salt Conditioner™ compares with a traditional water softener. The more water drops in a column, the better that system will perform for the given task. You can see that in most cases, the EasyWater® No-Salt Conditioner™ will do a much better job than a traditional softener. Now the challenge will be to determine which of these things are most important to you, and the degree to which they’re important – because each system will do almost everything on the list, to some degree. What does the EasyWater® No-Salt Conditioner™ do? The EasyWater® No-Salt Water Conditioner™ is considered a water conditioner, and not a water softener, because it does not remove calcium or magnesium from water. Rather than removing the hardness minerals, the EasyWater® No-Salt Conditioner™ physically changes them to keep them from adhering to surfaces. In this way, the EasyWater® No-Salt Conditioner™ will protect against scale build-up, even though the minerals remain in the water. Because there’s no need for salt, the EasyWater® No-Salt Conditioner™ is more environmentally friendly, better for your health, and easier on your wallet.